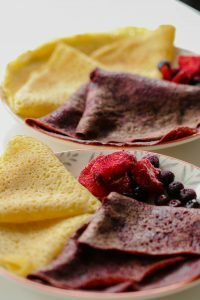 The Sweet Potato Powder makes a perfect gluten-free substitute in this Sweet Potato Crêpes – Vegan & Gluten-Free. Between crêpes or pancakes I would always choose to go for crêpes, probably because I used to have them so often as a child and loved how they fold so easily, I could just take them directly into my hand and enjoy them while walking around daydreaming 😊. Where to find some Sweet Potato Powder? Sweet Potato Powder has made a big entrance into my kitchen, I love experimenting new recipes with it, either to make delicious muffins, cookies or crêpes. I was lucky enough to get my sweet potato powder as a gift sent to me from the beautiful Indonesian island of Bali. Since shipping is expensive and because I won’t be going to Bali anytime soon I will have to get it somewhere closer 😊. When looking online, sweet potato powder seems to be popular on sport & nutrition pages such as Bulk Powders, the reason is that sweet potato powder is rich in fibres, vitamins and minerals as well as being high in antioxidants, making it a very nutritious food to add to our diet. 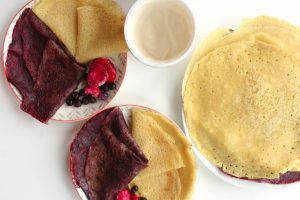 Sweet Potato Powder can be added to your favourite smoothie, but if you have some time then you should make this delicious and nutritious Sweet Potato Crêpes – Vegan & Gluten-Free. 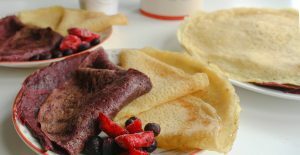 The sweet potato powder will bring colour and natural sweetness onto your breakfast table, as well as contributing to a light batter. Sweet Potato Powder is a great substitute to wheat flour in this gluten-free recipe. 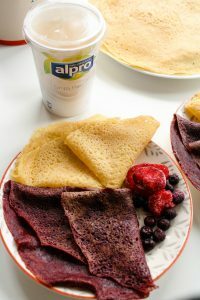 I also add some cornflour which makes my Sweet Potato Crêpes – Vegan & Gluten-Free extra light and fluffy. 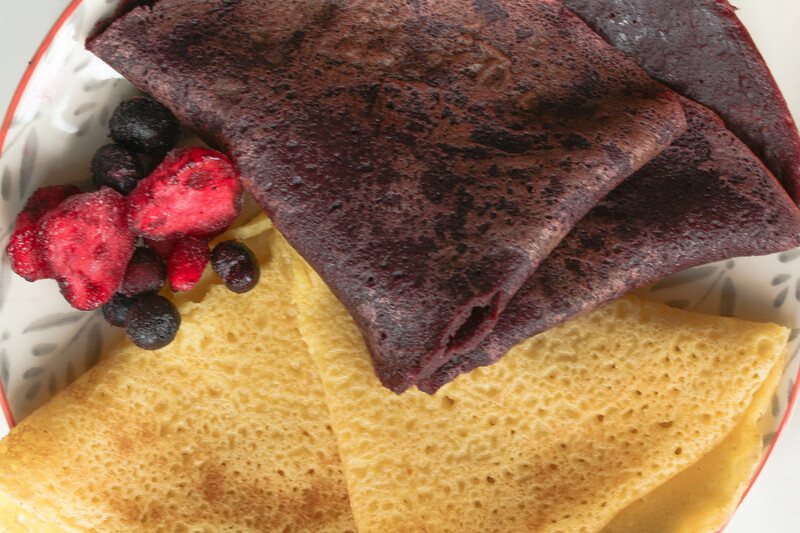 I hope you try and like this Sweet Potato Crêpes – Vegan & Gluten-Free, if so let me know! Share on Pinterest and tag a photo on Instagram #mimies_delicacies so that I can see your lovely creations as well as helping me reach more of you lovely people. Merci my friends! In a large bowl, stir together the sweet potato powder, cornflour, cane sugar and salt. Next add the dairy-free milk, rapeseed oil, vanilla extract and keep stirring until smooth. Grease your pan and get it hot before turning the heat down slightly. Spoon the batter into a ladle and pour in the pan all at once, spreading it all over by moving the pan in circles. Leave it for a minute or so and flip on the other side for another minute. Garnish with your favourite toppings, fruits, NOTella, or cinnamon ... The options are infinite!